(CALGARY) Toyota Canada Inc (TCI) today announced the Canadian debut of the 2010 Tundra full-size pickup truck with an all-new more powerful and more fuel-efficient 4.6-litre V8 engine in the spotlight at the 2009 Calgary Auto and Truck Show. The new 4.6 litre V8 engine is available on 4x2 and 4x4 2010 Tundra models. With 310 horsepower, 327 lb-ft. of torque and preliminary fuel consumption estimates of 14.0 L/100 km* city, 9.9 L/100 km* on the highway and 12.1 L/100 km* combined, the new engine achieves 12 per cent more horsepower and is 11 per cent more fuel efficient than the previous 4.7 L engine it replaces. 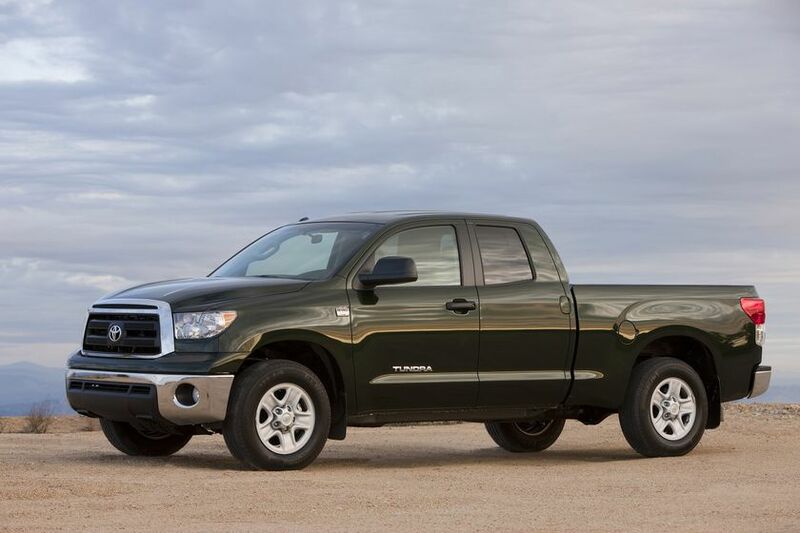 The new engine’s performance can be directly attributed to two technologies that are new to the Toyota Tundra. The 4.6-litre V8 features a Cooled Exhaust Gas Recirculation (EGR) System which reduces smog-forming emissions and improves overall fuel efficiency. Additionally, this new engine adopts an Acoustic Control Induction System (ACIS) to optimize power and torque output. As with Tundra’s optional 5.7-litre V8 engine, the new 4.6-litre V8 will be mated with a six-speed automatic transmission. The six-speed features a TOW/HAUL Mode to maximize performance when towing. All 2010 Tundra models receive a freshened look with a redesigned front grille and tail lamp design. Additional standard equipment on all Tundra models include driver and front passenger knee airbags and a redesigned seven-pin towing hitch wiring harness connector that sits above the hitch to help avoid damage during high departure angle driving. Also, a shelf to help organize storage space has been added to the lower glove box. New and upgraded models and packages give Canadian pick-up drivers more comfortable amenities. A new Leather and Navigation Package is now available on the popular 4x4 Double Cab SR5 model. The 4x4 CrewMax Platinum model replaces the Limited model and adopts comfort and style amenities, such as: unique 20-inch alloy wheels, chrome interior and exterior accents, distinctive perforated leather seats, heated and ventilated front seats, USB audio input, and more. It offers an available Navigation Package that includes an in-dash 4-disc CD Changer, voice-activated DVD Navigation System, Back-up camera, and XM Real-Time traffic capability. Other available features for the new 2010 Tundra include Integrated XM Satellite Radio, Bluetooth, auxiliary inputs, and adjustable headlamp levelling. The 2010 Tundra will arrive at Toyota dealers across Canada this spring. The 2009 Calgary International Auto and Truck Show runs from March 11 to March 15, 2009 at the Roundup Centre and Corral Stampede Park. * Fuel consumption figures based on 4x2 model are preliminary and subject to change.